Looking to get out of the city? Head to szentendre for village strolls on cobblestone streets. The village sits on the Danube and has some of the most eclectic museums, shops and old world charm. What I love most about Szentendre is its proximity to Budapest and the fact that it’s even on the train line outside of my front door. You can reach this city by car, train or boat. Renting a car is not needed, and if you're savvy like me you'll skip the tour buses. The cheapest way is taking the HEV on the suburban line H5, which can be taken from the Batthyany tér Metro station and is a quick 45 min ride. Make sure you get on the right train as the line splits at one point. If you have a single ticket or a monthly pass like we do you can buy the special train ticket to Szentendre on the train for an extra 300 HUF. 300 HUF is about 1 euro, although they only take Hungarian Forints so bring your coins. The other most popular route is by boat. We wanted to take the boat back to the city but our trip was cut short with rain, heavy winds and a 2 month old that need to escape those conditions fast. Check out the leaves in my hair, due to the wind storm. Anyway you can buy round trip tickets on the boat and during peak season the boats are likely to sell out so be sure to book in advanced. Check the times as there are only a few boat rides a day. 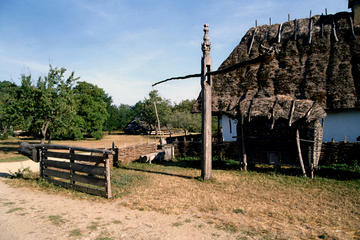 1 - Take a step back in time at the Skanzen museum and see how people used to live back in the day. 2. 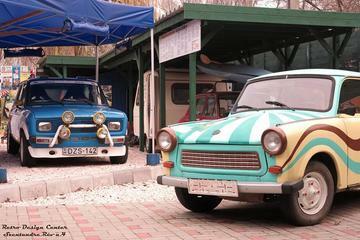 The Retro Design Center is such a cool way to see what the communist era really looked like back in the 1970's! 3. Sick of the typical walking tours? Explore the city buy bike. Such a fun way to see this artist city. Langos, lavender Ice cream, homemade Goulash, and wash it down with Hungarian Palinka in Szentendre. Take epic shoots for your Instagram underneath the colorful umbrellas. Wander into shops. Don't forget to support the local vendors and shops with a smile, as they work long days. They all might not be super warm and fuzzy, but I think a smile goes a long way. When you're done strolling the streets don't forget to walk the small strip by the Danube, and maybe have a drink with a view. Yes, Szentendre is a beautiful European village, but you could skip if you’re only in Budapest for 2-3 days. I suggest you make the day trip if you have extra time to explore old hungary. If you are looking for more day trips from Budapest read my reviews on Ezstergom, Eger, or Visegrad.